Gift of Albert H. Small, Jr. 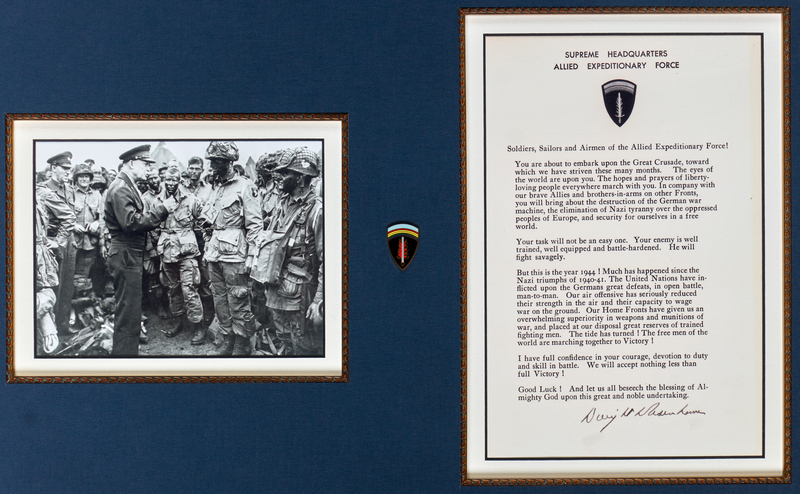 This order was issued by General Dwight D. Eisenhower to encourage Allied soldiers taking part in the D-day invasion of June 6, 1944. Almost immediately after France fell to the Nazis in 1940, the Allies planned a cross-Channel assault on the German occupying forces, code-named Operation Overlord. By May 1944, 2,876,000 Allied troops were amassed in southern England. The largest armada in history, made up of more than 4,000 American, British, and Canadian ships, lay in wait, and more that 1,200 planes stood ready. Against a tense backdrop of uncertain weather forecasts, disagreements in strategy, and related timing dilemmas, Eisenhower decided before dawn on June 5 to proceed with Overlord. Later that same afternoon, he scribbled a note intended for release, accepting responsibility for the decision to launch the invasion and full blame should the effort to create a beachhead on the Normandy coast fail. Much more polished is his printed Order of the Day for June 6, 1944, which he had begun drafting in February. The order was distributed to the 175,000-member expeditionary force on the eve of the invasion. The copy of this letter was a gift to the Club from member Albert H. Small, Jr., a World War II Navy Veteran. Small established Project Normandy: Sacrifice for Freedom, a foundation that selects students and teachers to build memorial websites for soldiers buried at American Cemeteries in Normandy. The Foundation funds their travels to France and tours of D-Day battlefields.